Organised for a rushed morning! There are times when you either wake up late or just stay in bed for 1 hour and then end up being late. When this happens, which might happen often, things get sacrificed to save time to get going. Although I don’t often run late, there are times I am and these are some of the things I do to help myself get back on track. To either minimise the amount of time I’m late, get there on time, or in some cases actually be early again. 1. Set your makeup out. I am a person that will generally always wear makeup when going out. This is because I feel more confident and awake when I have makeup on (I will also get fewer comments saying I look tired haha!) 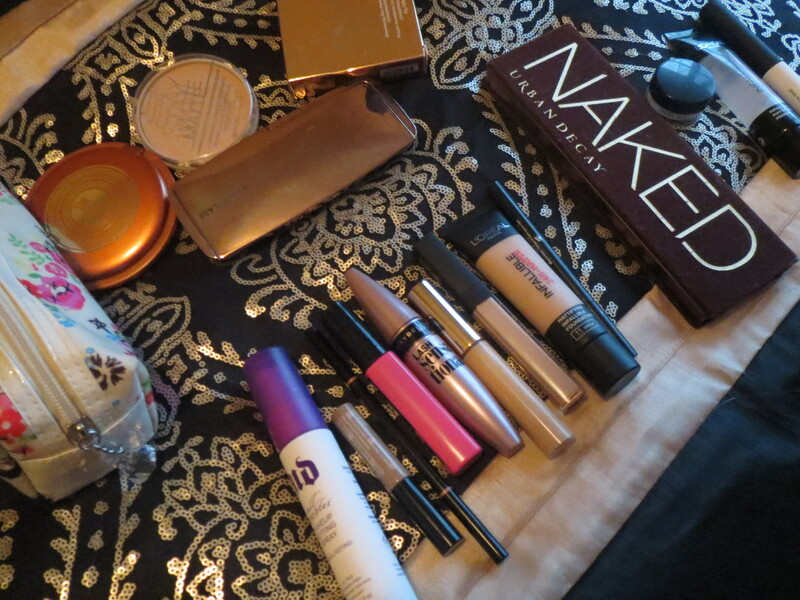 Now that I live between two homes things are a little less organised in terms of how I have my makeup stored. As I’m constantly switching stuff out at my rents house to take down to Adelaide to use for the week or fortnight depending on my schedule. At the moment, I have a full-length mirror in front of my window which I use to put my makeup on. In my room though there is no table and my makeup is stored in the cupboard on the other side of the room. So to save myself time and many trips from the mirror to the cupboard, I do a couple of things to make getting ready easier and quicker. First is a will put things in little piles. Such as concealer, foundation and powder products will be in a general location, making them easier to pick up in one big load. I will sometimes stack my powders onto my eye shadow palettes so free my hands up. I will also have all my eye products together and set out. While I’m collecting everything, I will lay them out in the order that I put things on, e.g. primer, eye shadows, eyeliner, foundation etc. I find that this saves me time and also means I don’t get flustered and potentially missing an important step to my makeup routine. 2. Don’t look at the clock every 2 seconds. I know this one can be hard, because after all you’re running late and you need to know how much time you have left before you’re seriously late. But looking at the clock all the time actually wastes time that you could be using to get ready with. I have found that the less I look at the clock, but still rush around, the quicker I seem to get things done, and can even get more done in the same amount of time. So instead of checking the clock every 2 seconds, try to check every 3 -4 minutes. You might be someone who has too many choices, or is forgetful, there has been many times that I just didn’t know what I wanted to wear, both clothes and makeup and so got a bit stressed. I can also be forgetful in bringing things for other people, such as gifts, text books or even random things. I also often forget stuff for myself, as it was, this morning I almost left my rents without my toothbrush and my next pill sheet. That would not have been good! So, I do a couple things to help with this. One is leave everything together, your keys, uni bag, water bottle and that thing your sister was meant to give your friend four months ago. That way in the morning when you’re running around getting everything, you’ll hopefully just pick up the pile and walk out the door. Another thing I do is that while I’m showering, or eating breakfast (if I have the time) is think about what I want to wear and what would look good. I don’t have heaps of clothes so it isn’t a huge issue. If you do have more trouble, do the same like what you did with the keys. Lay out your outfit a day early so you just get up and jump into them. 4. Maybe give yourself time to procrastinate. I am someone who will wake up and check social media like the morning newspaper. So because of this, I sometimes lose track of time and end up running a little late, and generally have to sacrifice eating breakfast before walking really quickly for the bus. To help with this, I will wake up maybe 5 -15 minutes earlier than I have to, this is to make sure I can have that time to check my phone. If you can put off looking at your phone, and get on public transport, try and save checking your phone until then. I mean, realistically you’re going to sit on it for the 30 min ride anyway.